It's time to start making our estimates of sea ice for September. I'm submitting two this year to the Sea Ice Outlook, one based on a coupled air-sea-ice model, and one based on a more mature version of my statistical method from last year. You can join the fun by submitting a guess in the poll I'll put at the bottom of the blog. Remember, what we're trying to predict is the September monthly average extent. This is not the minimum daily extent, nor is it the area of ice. Keep your eye out for these details when comparing what different people say. In doing this year's estimates, I worked with Xingren Wu. As usual, talking out ideas with somebody made them better. That is part of why you see two statistical predictions. To make a curve fit, as usual, you first consider what shape curve you would like (straight line, or something more involved), and then look for the best version of that curve. The curve of the models doesn't look like a straight line to me. Nor does the observed ice. One way of deciding that is that the straight line that my eye puts through the observations for the first half of the data record doesn't sit on the straight line my eye puts on the second half. We prefer to be quantitative, of course, and running the numbers for the first 16 years and the last 15 years gives slopes of -0.045 and -0.152, respectively. To be rigorous, we would then want to perform statistical significance tests. Still, those look quite different. The curve that I chose is the logistic curve. Except it's upside down, so I had a little work to do of a sort that we often do in math and science. The logistic curve is most common in areas like population growth. At least in mathematical idealizations of population growth. Early on, when the population is small, the growth is proportional to the population. This makes for exponential growth, for instance 2% per year. But, as time goes on, the population starts to get large enough that resource limits take over. Those limits slow down the growth. You then slowly approach a limiting population. Considering the opposite of the thing of interest is often useful in math and science. In computing probabilities, it is often easier to determine directly how likely it is for something not to happen, than for it to happen. But, since the probabilities have to total to 1, if you know one side (happen versus not-happen), you can then easily get the other. So go with what is easiest to work with first. We'll come back to this point in thinking about when we might see an ice-free arctic (September average). In my case here, the ice cover is not growing -- it's shrinking. So I can't do a logistic curve of ice cover growth. But the opposite of ice cover is open water. What I can do instead of considering ice cover is to consider the area of open water. This fits nicely the general idea of a logistic curve. In the early part of the growth (of open water), there is a feedback that more open water leads to more open water (due to increased heat absorption by the ocean, thinner ice, ...). The 'population' of open water is limited, though. You can only have as much open water as there was ice cover to begin with. One thing which has bothered me about, say, linear extrapolation, or quadratic, etc., is that if you go far enough into the future, they say that ice cover will be negative. With the logistic curve growth of open water area, this will not happen. As you see above, the ice extent goes to zero and stays there. But it never becomes negative. I then ran my program to search for the best logistic curve -- one that has the least squared errors. That gives my plot above. But, in talking with Xingren, we realized that quite a lot of logistic curves were very, very close to as good as the best one. We could ignore those others (the 'ensemble' of curves). But, given the uncertainties in the data, this didn't make much sense to us. What we did was to take all the logistic curves that were pretty good, and average their predictions of what 2010 would see. That's the ensemble prediction. For the Sea Ice Outlook, it is our preferred prediction (preferred over the best single logistic curve). When might we see an ice free (September average) Arctic? Reminder: I don't speak for my employer, whoever that is. Interesting - I don't think I've come across the logistic curve before, it looks like a useful tool (I plan on doing a modelling course next year). A nice explanation, and I thank you for it. I had kind of hoped that 2007 would hold the record for a similar amount of time as 1995 did (about a decade) - but your curve makes that look very unlikely. For quite some time I've been thinking about the sea ice curve as a process with a lot of hysteresis, which looks very much like the upside down logistic curve. The lag is the need to rebuild multiyear ice when there is significant melting. Not that I know much about ice dynamics, but the logistic curve just looks wrong to me. Once ice cover is sufficiently small I think it would be unstable. There is nothing to keep the water at freezing and larger waves in the open water will crush the remaining ice or push it south where it will melt. I don't understand why you are bothered by a linear extrapolation reaching negative values. It's common that extrapolations break down at some, hopefully physically obvious, point. Drop a ball and you can extrapolate its path as a parabola, but only until it hits the floor. Thomas, think land-fast ice shelves, such as those along the north shore of Ellesmere Island and in the longer northern fjords of Ellesmere, Baffin, and Greenland. Being more massive, some of that floating ice will take much longer to melt than free-floating multi-year pack ice. "… ice conditions changed drastically when a tremendous wind storm swept across the North Slope for three days. Visibility dropped to just a few feet. The wind gusted to over 102 mph and sustained winds of 50 to 70 mph were common …. The worst factor of this storm was the powerful wind which drove ice crashing onto the shore…. the ice stacked up along the shore to a height of 20 feet …." Do you also expect a logistic curves for sea ice volume (and area)? Have you considered trying to also fit a logistic curve to volume? What probabilities would that come out with using just a logistic fit to ice volume? How would you then reconcile differences in the probabilities from two or three such methods into one believable probability? Always a good thing to know about more things. As you see from Eli's answer, there's a different good example that I could also be drawing on. But I'm more familiar with logistic curve than hysteresis, so went with that. Something you can do, though, is start working on applying the argument I did in when will arctic ice be gone. Except you'd use a criterion of the 2007 average instead of 0. By eye, I agree that it looks likely that the new record will be set before 2017. You see/show the weakness of heuristic curves. It looks good to me, but 'looks good' doesn't have much persuasive value. The wave-induced breakup process is something already being observed, though, so to the extent that the logistic curve is appropriate, it won't be surprised by waves. Your point about extrapolation is good. That's why other reason for the logistic curve is that the data we already have don't look linear. Good example. That's also why multiyear ice is thick. In general, it is not because of freezing. Thicker ice insulates itself so as to not freeze much. But being slammed against the Canadian Archipelago or Greenland suffices to pile it up impressively. I haven't run the numbers, but yes, I do think area is probably going to be equally logistic to extent. Volume, on the other hand, it is not so intuitively clear to me. Maybe. Something that bodes well for me playing with the volume numbers from PIOMAS is that I've recently been talking to Ron Lindsay (one of the folks involved in that model). We have some overlapping work interests. I'll be late July before I can really do anything about it, but it'll be an interesting thing to pursue. Methods of reconciliation would depend on how different the different methods were. If they made similar estimates, with similar uncertainties (or at least that we had similar confidence in them), then the right thing to do is fairly straightforward. I'll illustrate this next week, when I turn to how Wu and I came up with our model estimate. On the other hand, if we really don't know what confidence we can have -- as happened between the model and the statistical method -- the most honest and meaningful thing to do is simply report the different estimates. If you could tell me how to get the 'most recent comments' box to be a little narrower, so as to display next to, rather than below, the index terms, that would help a lot. I haven't had time to fool around to get it going myself. Good thought provoking piece. 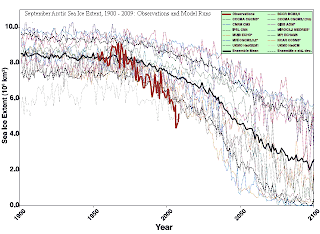 In your predictive model output as with most of the others the current rate of ice cover loss is seen as at or a close to the maximum rate, what about the potential for a steepening trend, what is it that seems to limit a faster sea ice extent loss? The heat transfer in is maximum at soltice (subject to weather variation). The peak melt rate is always later which is not too suprising - the later in the melt season the thinner the ice. After the peak melting rate, the downward trend in rate is suprisingly linear. (OK 2008 does not look linear but then 2009 has a big jog in the other direction.) The heat transfer in is not linear, so what pattern of increasing areas of just above 15% ice cover occurs to make the trends in ice melt rate look linear? If the volume is particularly low this year, presumably this pattern of increasing areas with low ice cover may be more important this year so leading to a more curved in 2008 direction shape. If 13 days reflects weather variability, are the other 22 days of peak rate variability predictable from factors other than weather? When will Arctic ice be gone?